Being a freelancer and having a complicated chronic illness mean I’m often stressed about money, or restrictions because of the limits of my health, or both, as in a recent $634 bill for natural medication. But it also means I’m often forced to lay low, by my own discipline,my family forcing me or my body just shutting itself down. I had worked three full days in my family office and then gone out with some food media/publicity friends late into Wednesday night, meaning that Thursday had to be market a NOTHING! day in my calendar. Being Halloween, that NOTHING would include watching American Horror Story (! ), buying cider from the corner store, avoiding going downtown, and catching up on some writing / blogging. Yes, writing and blogging aren’t doing nothing. But when I have space for them sandwiched by American Horror Story and rainy walks with Mitra, they’re relaxing, too. So there I was, infuriated by my ancient computer’s incapability to work with me by loading pages and saving documents and such, when I threw up my hands, powered down and walked into the kitchen. Because freelancing and NOTHING also mean I can put my hands into (gluten-free) flour and slice fruit when I feel like it, dammit! So yesterday this is what came from my I-HATE-MY-COMPUTER-walking-away period. An incredibly easy galette for two. Because I’m one lady with one roommate, and very little willpower when there are sweets around. 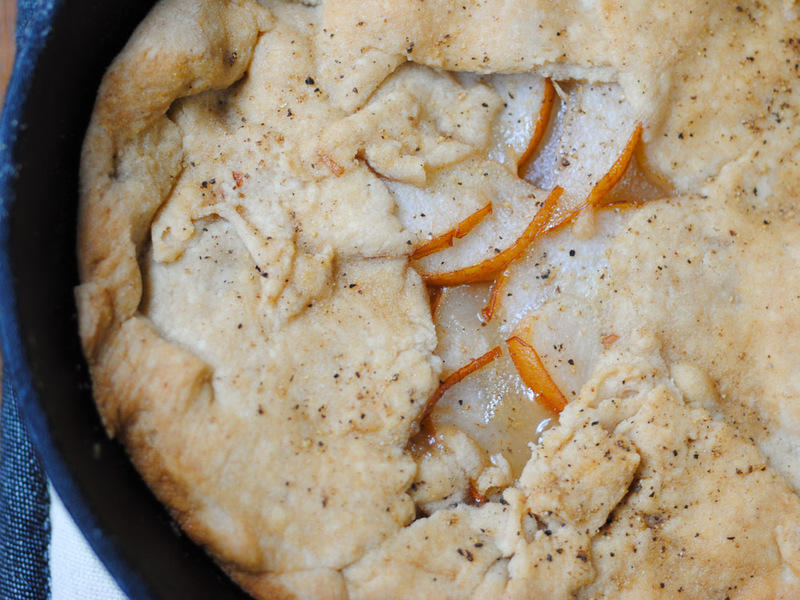 Making pastry crust can be difficult, and annoying, and brilliant, and delightful. It can also be ridiculously simple to accomplish when you (a) roll and adapt with its progress and (b) aren’t gonna stress about how the final product looks. With this I threw together a heaping half cup of my gluten-free cookie flour, some cinnamon and salt, a few tablespoons of butter and a touch of maple syrup for the crust. I then filled this baby with one Bosc pear sliced incredibly thinly (cheese knives are AWESOME for thinly slicing fruit and butter!) and tossed with a bit more maple syrup. Sprinkled with pepper and into the oven for 30 minutes, it’s fragrant, seasonal and perfect for when you need a simple, satisfying dessert for you and a friend. With this recipe — be flexible. I literally just put in a grind or two of salt a sprinkling of cinnamon. I heaped a scooped cup of flour. There are no eggs in this crust, so there’s very little to hold it together other than the starch and gum in your mix, so make sure it has both. Notes on how to best roll it are in the steps below, but if it’s a touch crumbly when you serve, who cares!? The flavor is delightful — naturally sweet from the fruit and syrup, and warm and crusty and just happy-making. Oh, and a sprinkle of freshly ground pepper on top grounds it a tiny bit, and is just gangbusters. We often talk about precision in baking, and how it’s a science and all. And that’s often true. But it’s also true that fruit and flour taste magical together, and a little fun and a whole lotta love make things darned tasty too. Oh, and my computer must have sensed it’s being written about, because it’s performing beautifully now. And the $634 worth of medicine at least gives me comfort that in a few weeks certain symptoms will plague me less. I’m dry, warm, typing by my window and my apartment smells like spiced pears. Life is beautiful. Preheat oven to 350°. Either line a cookie sheet with Silpat or parchment, or butter a small cast iron pan. Core and thinly slice pears. Toss with 1 Tbsp maple syrup and set aside. In a medium bowl, whisk flour with salt and cinnamon. Cut butter into cubes, toss with flour, and work together with fingers until crumbly. Swirl on maple syrup, and pull together with a fork until a dough ball forms. If your mixture is a tad dry, add a teaspoon of milk or very cold water, one at a time, until the dough pulls together into a ball. If it feels a bit too pliable, flatten it into a disk, wrap in wax paper / parchment / plastic wrap and fridge for 20 minutes or so until it firms up slightly. Flour a long sheet of parchment paper (works much better for this than wax paper) and rolling pin. Pat the dough into a ball, and press into a disk. Slowly roll out the dough, flipping it and re-flouring as much as possible, using smooth strokes to push the dough from the center to the edges, until you get a thin disk. If using a small cast iron pan, make sure it’s two inches wider than the bottom of the pan. Gently turn the dough over onto your prepared cookie sheet / into the pan. If bits break — don’t worry about it! Repair as needed. Tuck the pears into the dough, and fold the edges over it. Using a pastry brush, brush remaining pear juice / maple syrup on the top of the dough. If desired, sprinkle with freshly cracked pepper and a touch more salt… it’s yummy, promise. Bake for 35-40 minutes or until the pears are soft and the top is lightly browned. Cool a touch before serving. I might go with a gluten filled version but love the combination of maple and pear. Yum! I am all for people devouring gluten if they can!! This would be even EASIER with APF!! Let me know how it comes out, please! A Question? How do I make GF bread lighter and not dense? I don’t make gluten-free bread (just gotten so used to living without bread I’d rather invest my caloric intake in sweets!) But in general gluten-free baked goods do well with a heftier dose of eggs – beaten separately and incorporated in helps too – and an increased amount of leveners like baking powder and soda. I generally double the baking powder in a recipe and add a small amount of soda depending, too. Hope that helps! The galette looks divine! I can almost smell it from here :) or rather wish I could. Thanks, Dana! Am very excited by how easy it is. Probably one of my easiest recipes ever! This looks delicious! What a perfect treat this time of year. Thanks! It is – not too sweet or filling and a beautiful testament to fall. Love it!